Two performances remain for Don Giovanni: one this afternoon and one tomorrow evening. The casts alternate, and some believe that the Friday and Sunday performances enjoy the superior one. I have no complaints at all about the performers who’ll sing in the Monday performance. Historically, the Friday (and Sunday) casts have tended to be better known and the alternate casts have tended to employ younger singers. This is the most enjoyable live performance of this work that I’ve ever attended. The San Antonio review seems to have beaten Austin papers into print, and in general I’d agree with it, although the reviewer (Diane Windeler) attended on Friday. Leporello does nearly steal the show. David Nancarrow’s lighting design, as always, is wonderful, except for the treatment of the Commendatore at the end. The direction allows full appreciation of the plot. The music alone is worth the ticket, but this is theatrical experience for the eyes as well, complete with sumptuous costumes. Those attending on impluse will find tickets available at the box office and beverages and desserts during the intermission. Call 472-5992 for ticket information. After a series of private openings for museum members and select audiences, the Blanton Museum of Art threw open its doors to the general public tonight at 9pm. When I say “threw open,” I mean it allowed guests to line up and start trickling in. I arrived around 10:30 to find the line extending all the way around the museum. Fortunately, the UT Marimba Band was set up outside to entertain those who preferred to indulge in the cash bar rather than wait in line. Also fortunate is the extended series of events that go on continuously for the next 24 hours, presenting many more opportunities to actually enter the latest addition to Austin’s culture club. I’m going to try and coerce the wife into watching cartoons with me tomorrow morning at 5am; I’m sure that’ll go over well. Without having set foot inside the building, my impressions thus far are limited to the exterior. The design is a bit plain, but adds an understated hint of class along MLK Boulevard, particularly in contrast to the extreme Texan-ness of the Bullock State History Museum across the street. 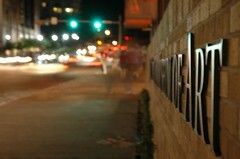 The museum also adds an element of walkability along a stretch of campus that has generally been little more than a path to the Erwin Center or Memorial Stadium. I’m looking forward to seeing the exhibits tomorrow, as well as the impact of this building in the years to come. Update: We did in fact make it Sunday morning, and I’m glad not to have waited the 2+ hours in line that was required Saturday night. The coffee and donuts were inviting, and the stirring music from the UT gospel choir provided an uplifting soundtrack for our brief tour. The collection is quite diverse, with a heavy dose of contemporary works and multi-media setting the tone downstairs. Upstairs, there should be enough European classicism and Remington-esque Western realism to satisfy those who consider modern art one step away from playing with building blocks. The interior is open and softly lit, with an overall design that is comfortable if conventional. An article in the New York Times explains the controversy over the Blanton’s initial design that was rejected as being “too bold.” I suppose if Austin wanted its own version of the Tate Modern, the Seaholm building would have been the ideal candidate, but that train has already left for a high-rise station. I’ve uploaded my pictures from the evening and morning visits to Flickr. South Austin’s own Whip In marks two decades of history this weekend with a free show tomorrow Sunday, May 7, at the Continental Club from 2 pm until it’s all over. There will be no cover charge. Beginning at two, a new band takes the stage each hour until James McMurtry comes on at 8 and Heybale at 10: 1001 Nights Orchestra, Rumbullion, Combo Mahalo, Cooper’s Uncle, Gene Taylor, Texas Sapphires, James McMurtry, and Heybale. The illustration shows Whip In’s original mom and pop. It’s the wrapper from another of the redoubtable Chef Keem‘s chocolate creations. It’s marked “A little sweet – from a sweet little corner shop.” This treat, unlike the show at the Continental Club, is not free, but it’s worth every penny. 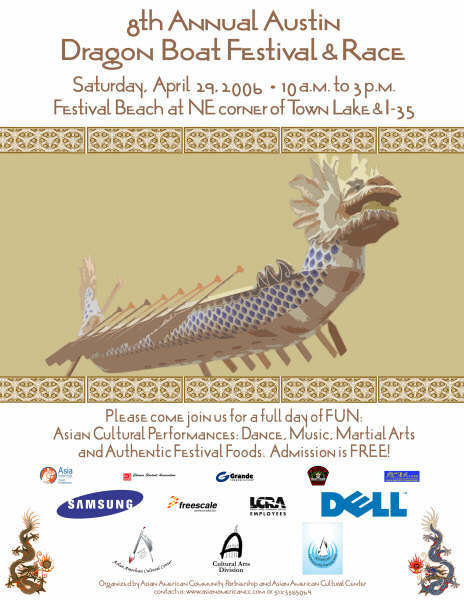 Tomorrow from 10 am to 3 pm at Festival Beach (just east of IH-35 on the waterfront), the dragon boat races return for the eighth year, along with lion dancers, exhibitions of martial arts, dance performances, music, sales of crafts, and authentic festival foods from many Asian cultures. Admission is free and this is always a wonderful family event. Even if you’re a sardonic, sarcastic, cynical, pessimistic person, you may have annoyingly cheery friends. And they may be the sort who relentlessly and unfailingly “keep on the sunny side, always on the sunny side, keep on the sunny side of life,” the sort who frequently send you, not jokes, not political screeds, but what they see as good news, of the non-evangelical sort. Some of what heads my way comes from Happy News. And Happy News is right here in Austin. Two blurbs on the site are: (1) “Look for some happy news for a change,” and (2) “Real News. Compelling Stories. Always Positive.” Just so you know. I myself am late in finding this out; a December Associated Press feature was disseminated fairly widely. Today’s in-box happy news that prompted me to look into this phenomenon is entitled 2 Brothers Recycle Birthday Card. The card-recycling is a long family tradition for us so I know the reason this particular story was sent, but this was the item of Happy News, not all its many and peculiar predecessors, that led me its Austin origins. Last year’s smoking ban wasn’t the last assault against those modern day lepers known as smokers. The Texas House passed a $1/pack tax increase today to offset the property tax cuts. Of course, the Senate will have to approve it as well, but if they do, that’s a 60% increase on what you’re currently paying. Those trips to the Gas N Sip for smokes and a refuel are getting more and more painful. Texas Music Matters has a follow-up on the effects of the nearly 9-month-old smoking ban. The report cites mixed results with at least one bar claiming not to have seen much of a difference. The consensus seems to be that it’s not affecting the Fridays or Saturdays or nights with big draw bands, but may be contributing to slower nights during the week and forcing some club owners to shut down on weeknights that were already slow and have become economically unfeasible since the ban. At least Lovejoy’s is still open although I do believe that ownership changed hands. Driving home up MoPac tonight, I had to do a double-take when the SWAT van went screaming by in the opposite direction. It’s startling enough to be reminded that Austin has a SWAT team, especially when they’re followed by an urban assault tank moving at remarkably high speed, but the backdrop of Barton Creek Mall made the scene especially surreal. The Statesman is reporting that the SWAT team was en route to Circle C, of all places, at around 7pm this evening to confront a man barricading himself alone inside a house. No word yet on what initiated the showdown, although I can understand how living in a master-planned community could generate some irrational behavior. I’m assuming that the SWAT team is stationed out of the downtown APD building (or perhaps flown in from someplace that has actual violent crime), but they should consider opening a rapid response facility in South Austin. Tonight’s encounter in Circle C(ompton) is just the latest showdown south of the river, following a January shooting in Southeast Austin and a stand-off on the Barton Creek Greenbelt last November. Both prior scenarios involved hostages, and ultimately resulted in the death of the suspects. Hopefully this confrontation will break the cycle on both accounts. First, you must listen to him, but afterwards it’s reported that there’ll be a Q&A session. All interested are invited to hear Art Cory, chief appraiser for the Travis County Appraisal District, speak this evening under the auspices of the Austin Neighborhoods Council. The topic is billed as follows: “Property Appraisals in Austin and the State Legislature’s Special Session on Property Taxes.” The location is the Austin Energy building at 721 Barton Springs. The talk begins at 7 pm after fifteen minutes of milling around. The TCAD 2006 appraisal database is up today. When I see the Susanna Dickinson house in Brush Square, all derelict and roofless, I’m saddened by its state. The successor building that stands on its former location may be seen to the left in this image. The historic connection with an Alamo survivor is the reason that the old structure wasn’t just plain demolished to make way for the hotel. For many, though, the history it brings to mind is more recent. It stands as a sad reminder of vanished BBQ delights, consistent and worth every penny, for which no replacement has yet been discovered. It was better protected when it was part of The Pit, preserved in wood smoke. Then it had a roof, and that roof covered many, many happy noontime diners and evening takeout customers. When the BBQ craving is too strong to ignore, we most often resort to the Iron Works. The quality of the meat is fine, though there’s some sweetness detectable in the rub. Nobody wants shoeleather, but the Iron Works doesn’t seem to keep two briskets going for slicing, just the one, which may be done to a turn, or not. Two out of three times, it seems, it hasn’t been in the pit a sufficient period to render out enough of the fat to suit the taste of many. Those two times create a disappointment; the third time’s a bonanza. Maybe the majority doesn’t like BBQ as well done as it used to. It’s wonderful that the Iron Works is downtown, even with its inconsistencies, because it’s a delightful place in and of itself, no matter how long the brisket’s been in the pit on any given day. But I’ll never stop missing The Pit #3. Ok, so normally I wouldn’t plug those carpetbagging ice cream hippies over our local favorite, but we’re talking free here, so I don’t feel like I’m cheating. The free cone giveaway is from noon to 5pm 8pm today. I tried to go to their web site to get you links to the local locations, but it appears that everyone on the planet is trying to do the same thing and has brought their server to its knees. If I recall correctly, there’s one just north of Braker on the east side of Mopac in the same shopping center as Yoga Yoga and Tacodeli. There’s also a location at 5th and Lamar, but good luck trying to park around there.